I picked up the challenge package in its plain brown wrapper from Satin Moon. 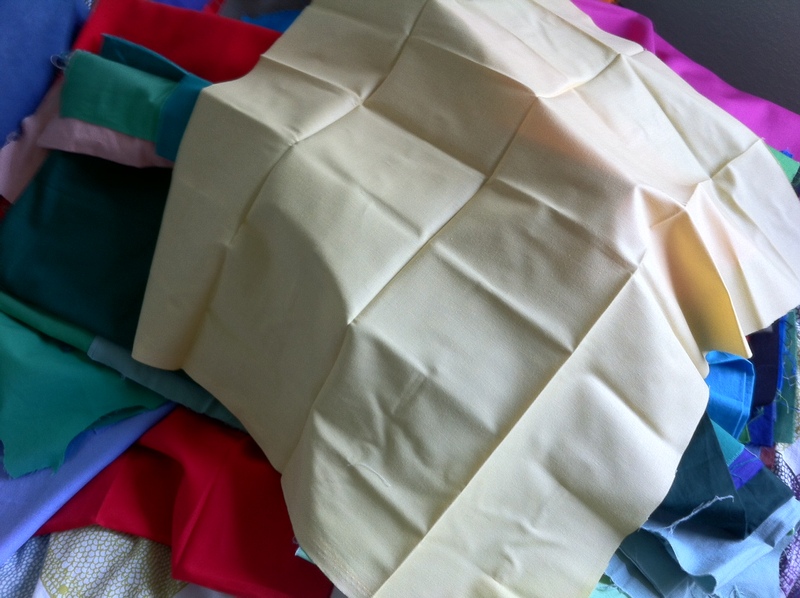 Everyone gets a fat quarter of a different solid fabric. How frustrating that this does not at all do justice to the colour. The rules are simple but a bit fiendish in that we are only allowed to use solid colour fabrics on the top of the quilt, no tone on tone, no batik, no prints. I have an idea of what I’m going to do and in fact was back at the store a couple of hours later because although I believe in busting stash and using what I have, I’m not going to sacrifice my art because I refuse to go shopping. In this photo the yellow challenge fabric is on the lower right with the fat quarter I bought this afternoon folded up on top of it. The yellow is closer to real life and the neutral fabric has somehow picked up a blue gray slate tinge (perhaps from the iPhone flash?) that doesn’t do it justice. Really it’s a deep beige. I had quickly auditioned promising solids by bringing them to the store and trying several neutrals that I thought might do. Now, I have no clue whether this will work or not, but click here to see these colours thanks to the wonders of Kuler. The yellow and light brown on the left of this colour scheme look close to these two solid fabrics. Now, off you go to play on Kuler! You know you want to …. 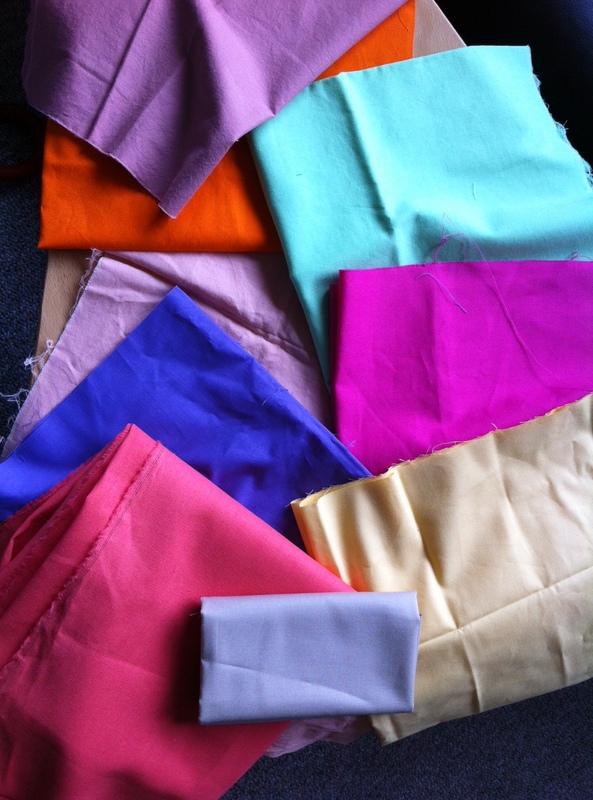 I love that staff at Satin Moon are so caring and supportive and will cut fat quarters of fabric upon request! This is only the first or second time I’ve ever requested them to do this for me. 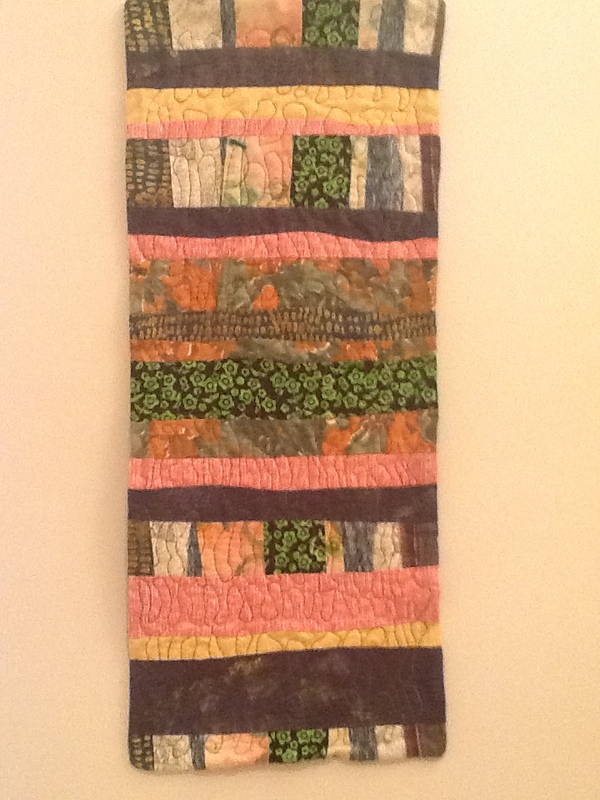 The quilt has to be ready by mid-October and the winner will be by viewers’ choice, awarded in mid-November. After which I will reveal my process posts, which will stay as drafts until that time. The baby for whom this is intended has arrived and is a girl! 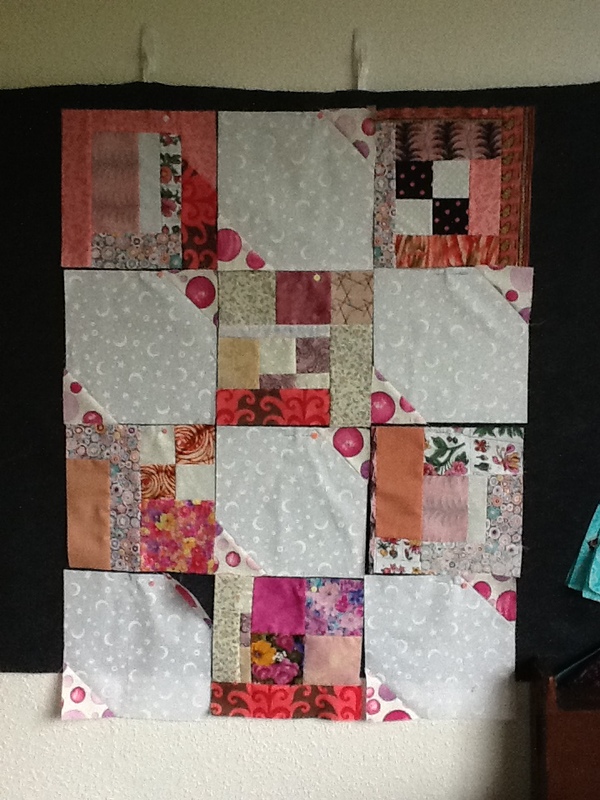 Not knowing the gender ahead of time, I had hoped to have 12 pink slabs and 12 blue slabs completed. I debated mixing pink and blue but then thought that more negative space might be a good thing. What’s weird with this layout? Which photo is better of the two pink layouts, iPhone or iPad? There are no right or wrong answers, just your own thoughts, please! Interested in exploring the modern quilt esthetic. 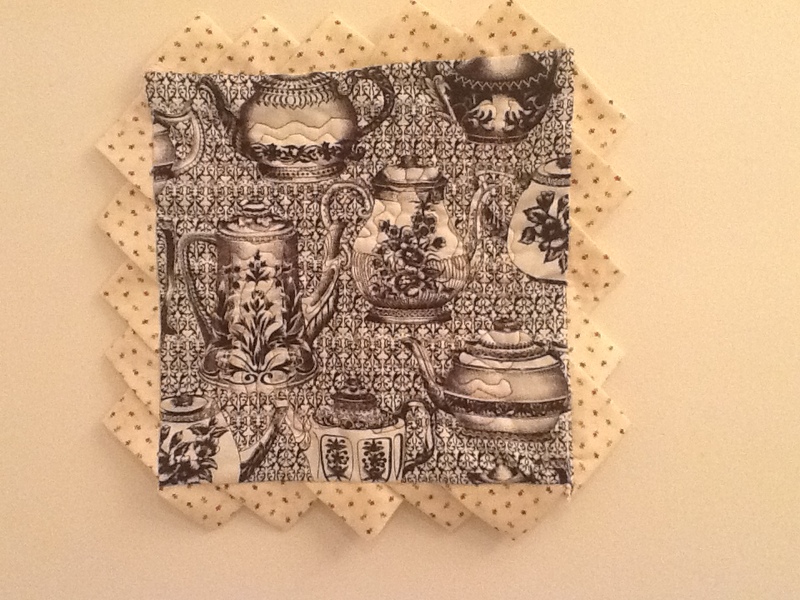 Satin Moon has a modern mini-quilt challenge and I plan to pick up my kit today. It was ALMOST ready to roll on Wednesday but they insisted on keeping it a surprise until the kits were prepared. And the first meeting of the Victoria branch of the Modern Quilt Guild is meeting at Satin Moon next Thursday, so It’ll be interesting to see everyone’s show and share. 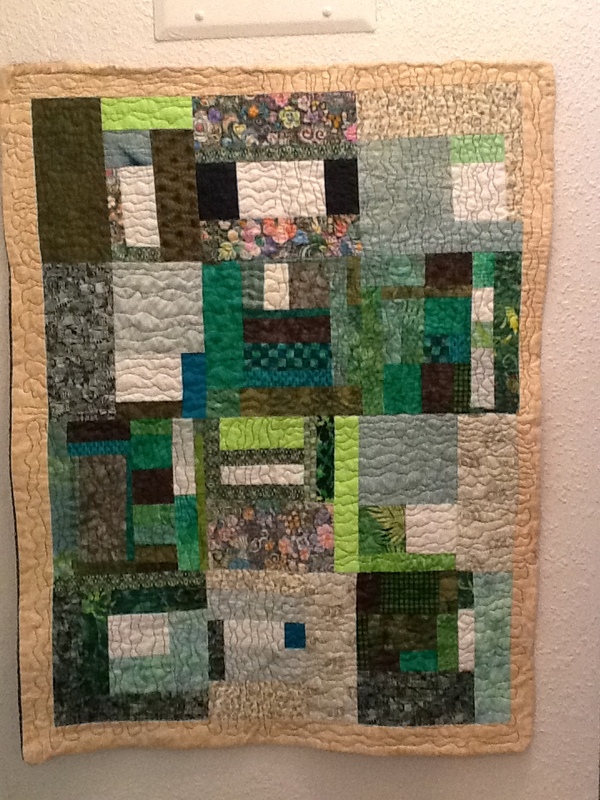 I may have to organize my slab quilt pix into an album on my iPad since the baby is waiting for her gift! 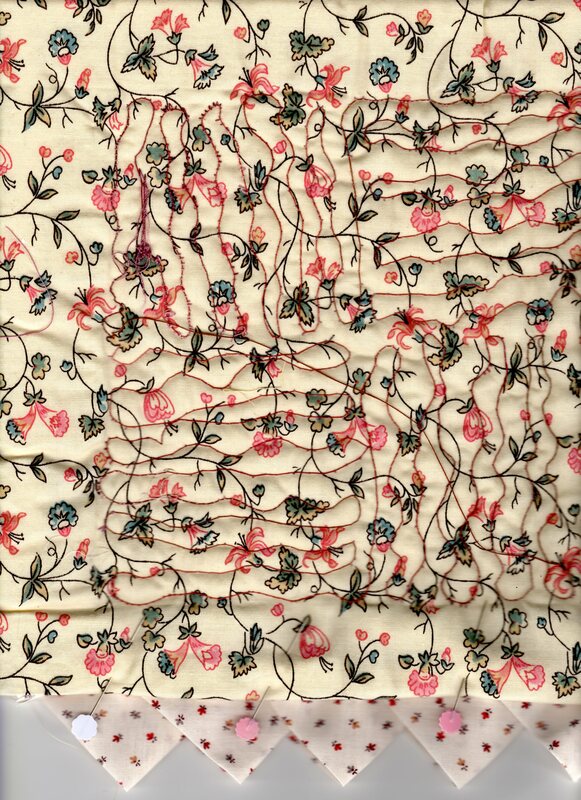 What to do with the ugly commercial fabrics? What to do with the muddy/unfortunate/bizarre results of dyeing and surface design experiments? Our guild is blessed with an extensive library and resource centre, where I found this book. After reading it several times I really REALLY wanted to experiment with the method, but given the other projects I have on the go, I had an argument with myself. I won and the left-brained disciplinarian lost (as usual). This method is very conducive to Working In A Series because there is just so much to explore. There will be more of these! This is the navy (see why it was a problem child?) 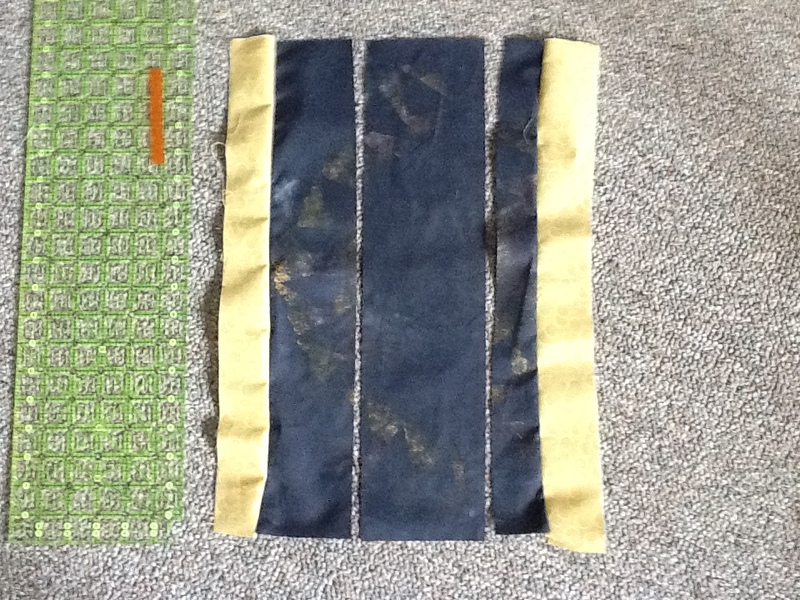 with yellow print attached to two of the strips. Here’s the strata that ended up being sliced between the horizontal areas. This shows much more clearly the beautiful pink and green deconstructed screen print. The pale green fan print is one I’ve used in many different pieces, although I’m not really a fan of 30’s reproductions, which is what this looks like. But I love being able to mix up such disparate fabrics as these, the green and black batik and the green and pink/purple/burgundy stripe at the top. Here is the top of the table topper for Young Sprout and Sproutette. I showed the back in all its “glory” here. I can’t remember where the coffee and teapot print came from but this was all I had of it. Hopefully this will grace many tea parties for their stuffies and dolls! I feel like the blue-gray shades in the centre fabric are fighting with the warm cream calico prairie point fabric. Perhaps light green or blue points would have been better. 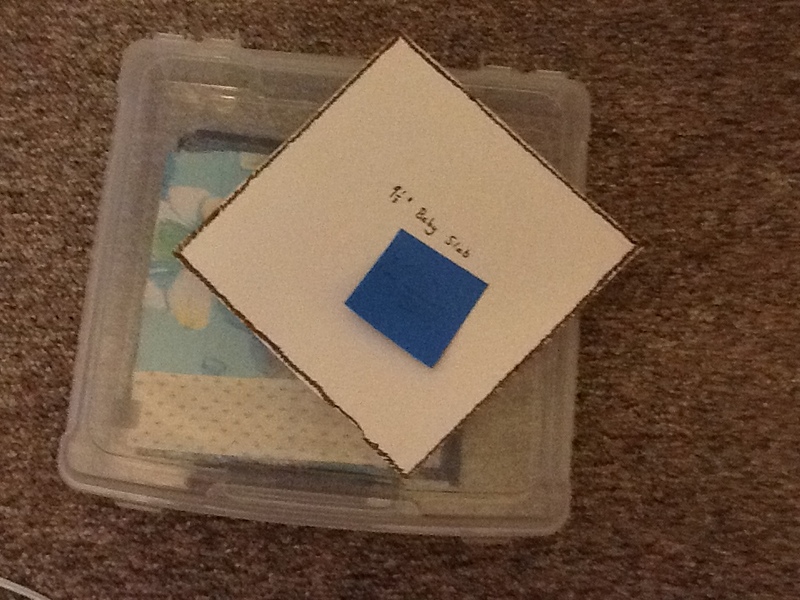 Actually not just finished, but labeled, loose ends neatly darned, pressed, wrapped and delivered! Sometimes I amaze myself, which counterbalances the many, many times when I fall short of accomplishing the projects I set out to complete. This measures 30 by 39 inches so its perimeter is 138 inches towards the CQA Walk to Brock Challenge. 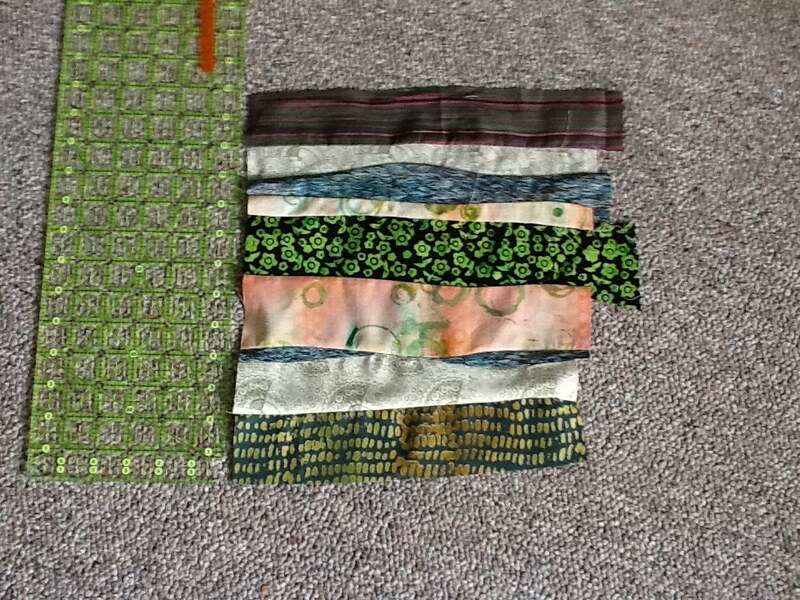 Next time I’ll go with a much lighter variegated thread for the free motion quilting. This is Valdani Green Pastures on the top and Ebony Almond in the bobbin. 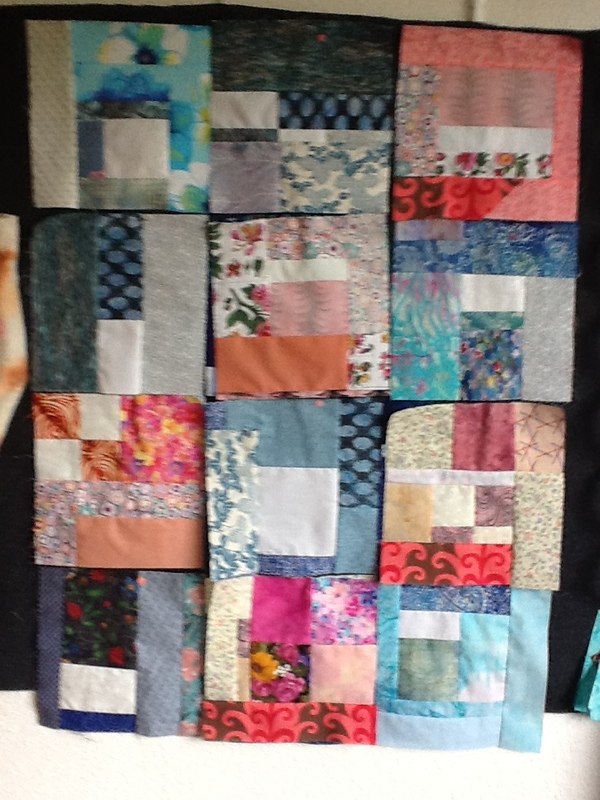 I had so much fun making slabs to help recover Southern Alberta that after I had mailed off the last package (the organizers had a deadline of July 30) I tweaked the concept and have started making baby quilts. Unfortunately this is the only photo I have of the first one because I was rushing to finish the top before our Guild meeting. 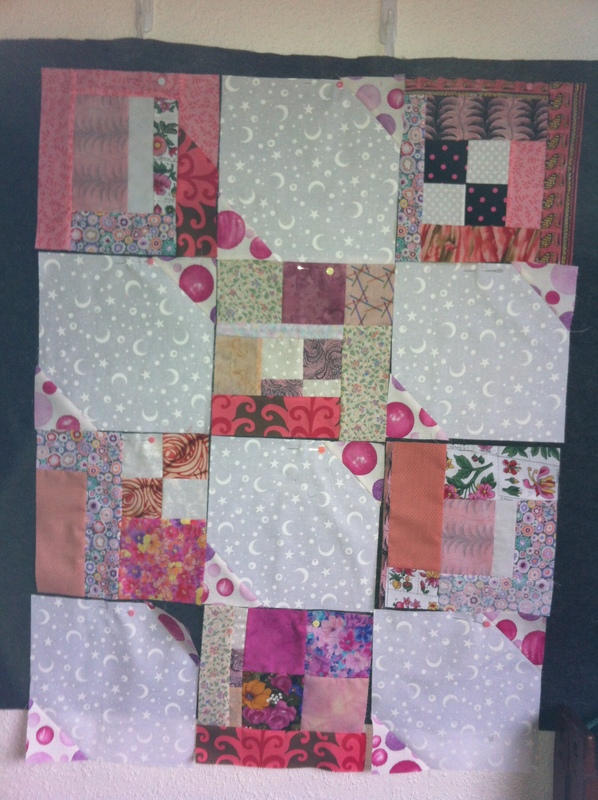 Anyhoo, the blocks are made just 9-1/2 inches to finish at 9 inches and I am putting 12 blocks in three rows of four and then adding a contrasting border to frame it. 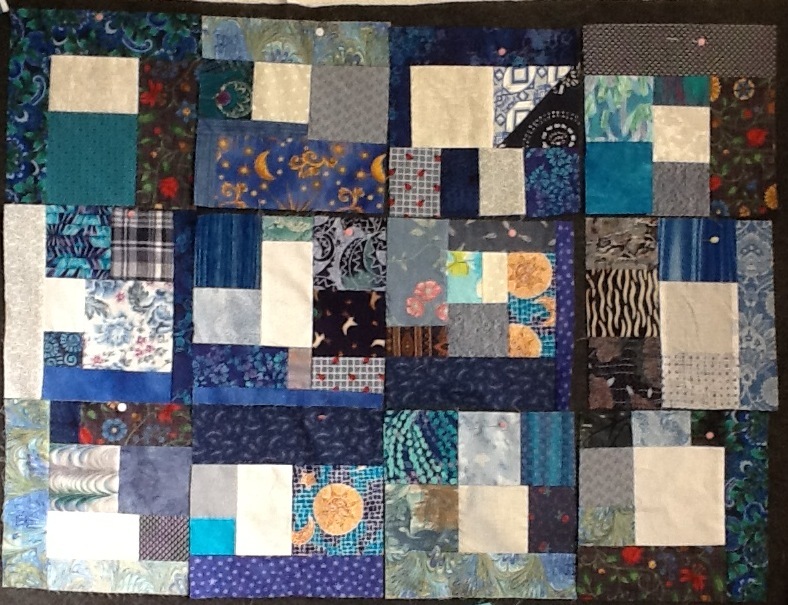 The blue quilt has a rust red tonal border. Thanks to Laine who contributed one large green block. 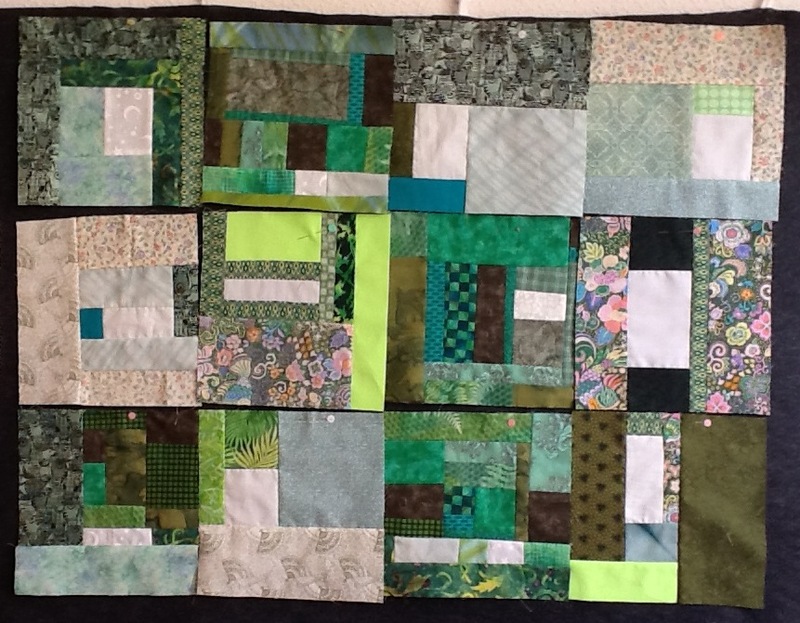 I trimmed into four baby size blocks, adding white and other green fabric as necessary. Easier to sew together if there are not too many seams on the outside of the top, especially on the corners! It never fails! My major projects, such as the dino quilt, always seem to generate test and practice pieces. And they in turn take on a life of their own. 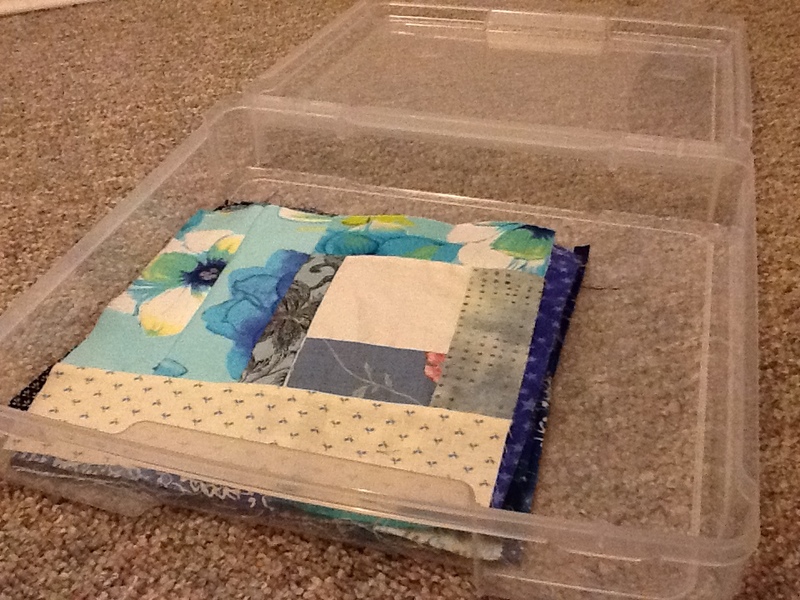 Yes, I could grab some ugly hard to use fabrics, make a quick quilt sandwich and grab assorted precut 3-1/2 inch squares (precut by me using Joan Ford’s Scrap Therapy system) and make sure I can apply Prairie Points. But I can’t bring myself to do that. Out comes a novelty fabric and some pretty chintzes and I’m making a table topper for Young Sprout & Co. They were recently blessed with a child size table and chairs and as soon as it was in their room, they found a receiving blanket to serve as a tablecloth. Since this is to be an Eid gift, for now I’m just showing the back. Ignore the birds nest of threads. This is still a work in progress as I have to deal with that and sew down the prairie points by hand. Then it will be on to the dino quilt, a much larger project, LOL!